The Lights and Sound, made by the Halex foosball table company, adds an arcade look and music to this unique table. You can hook up your MP3 player or smartphone to the adapter and play a game of foosball while jamming out to your favorite tunes through the built-in speakers. The LED lights pulsate to the beat of the music as they illuminate the tempered glass tabletop playing surface. 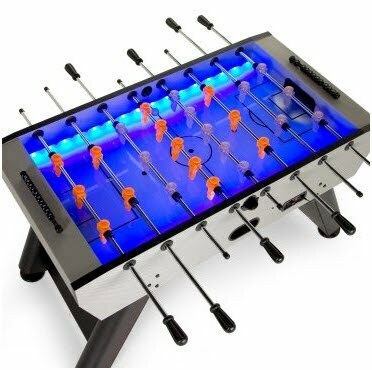 The see-through robot-style foosball men and translucent ball will glow in the dark as you try to score on your opponent. The Lights and Sound foosball table is made from MDF wood and strong PVC laminate, allowing it to last through years of games. This is truly a one of a kind table that you won't find anywhere else.